When it comes to microphones, we usually have two choices. ...while the other is Condenser Microphones. Since the article is specifically about best condenser microphones under $200, let’s stick to condenser microphones instead! Before we start let me give you an overview about Condenser microphones. If you require a mic specifically for recording instruments then Shure PG27 is your best bet as a cheap condenser microphone. Various instruments like Harmonica, Ukelele, Electric and Acoustic Guitar are played on it. Since it’s a side-address condenser microphone, you need to hold it sideways as seen in video above. You can be rest assured about the mic's quality because Shure have been making audio equipment for the past 80 years. Coming to Shure PG27; it’s a USB microphone and can be directly plugged into your PC. The microphone even has integrated pre-amp along with gain control which is always an added advantage for any condenser mic under $200. Shure PG27 package includes mic, an adapter for attaching the mic to a stand, USB cable and pleather carry pouch. It also includes a headphone jack that allows you to listen what the mic picks up in real time. This term is known as 'headphone monitoring' and is useful during gaming sessions; when you have Noise Cancelling Headphones on and don't need to scream into your mic. You can listen to what you're speaking right into your headphones. Even in multiple instruments recording; you can listen how different instruments stack up when played together. This allows you to change position of various instruments. "For the money you are spending Shure PG27 is very close to being best vocal mic under $200." Audio Technica AT2035 is a large diaphragm condenser microphone which allows for natural sound and low noise. 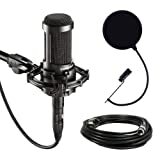 Similar to Audio Technica AT2020 (USB Condenser Mic), the AT2035 features a fixed Cardioid pattern. … which means you need to speak into the front side of microphone rather than on top of it. Unlike Audio Technica AT2020, AT2035 features a 80Hz high pass filter and 10dB pad switch. ​Audio Technica AT2035​ retail packaging includes a high-strength plastic Shock Mount and pleather pouch for carrying this XLR Condenser Microphone around. This means you need to buy an aftermarket XLR cable, Mic Stand and Pop Filter. … the only difference is, AT2050 features a Polar Pattern selection switch. Built quality of the mic is solid and durable. The Matte Black profile of this mic makes it look premium and superior. …however for the price, it could've been a bit better. It’s still my view and yours take on it could be different. These are however I would say best vocal mic under $200. "Once you get the right setup with XLR audio interface, Pop Filter and Mic Stand, this microphones will be a fun to work with." Here we have another XLR Microphone in our list i.e. 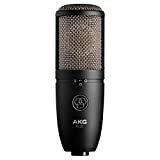 the AKG Perception 420 Professional Mic; which can be considered as one of the best budget condenser mic under $200. AKG Perception 420 comes with 1 inch twin diaphragm and have three polar pattern settings. Due to this; the microphone is well suited for recording vocals as well as musical instruments like guitar, cello, drums and so on. The box in which it comes with looks very premium for a vocal mic under $200; including a strong, solid and rugged shock mount. That’s the only thing you get as accessory and nothing else. 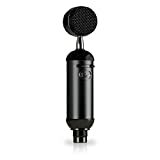 AKG Perception 420 Professional XLR Condenser Microphone has matte finish and comes in only two colors i.e. Silver and Black. Both of them look extremely attractive and premium. The mic body also features switch pad for high SPL applications up to 155 dB SPL. It does a great job by reducing low level unwanted frequencies and captures rich high-level frequencies; that is not the case with other cheap condenser microphones. Multiple polarity patterns, extends its use for multiple applications like two-person podcasting, game sessions recording and stereo mixing. However the only downside being; compared to other mics AKG Perception 420 doesn’t comes with a detailed guide on how to use this microphone. Check out its review and see this microphone in work in the video embedded below! Then look no further than Blue Spark. The microphone comes placed in a wooden box, which is a rarity at this price. The company also throws in a Shock Mount as well as small Pop Filter. However, it’s disheartening to see an XLR cable absent from the package. Hence you need to buy an aftermarket XLR cable. …however if XLR is not your thing; the company also provides a USB interface Blue Spark microphone that is compatible with iOS and Apple devices like iPhone and iPad. Microphone’s body features only a single button; which company calls as Focus Control, it allows you to toggle between Normal Mode and Focus Mode. Blue Yeti! Are you shocked to see it? A popular and best condenser microphone under $200 for Youtube Channels, Podcasting and Voice Overs. 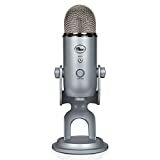 For good Youtube Audio, the ﻿﻿Blu﻿﻿e Yet﻿﻿﻿i is a goto microphone for anyone who requires professional studio like sound quality. This microphone fills the gap between cheap condenser microphone and studio quality audio. Since it’s a USB condenser mic, the box comes with the mic itself and just a USB cable. … hence you don’t need to buy an aftermarket shock mount and mic stand. However you might need a pop filter. 3 Condenser Capsules which the company calls as Tri-Capsule Array allows the mic to record in any situations like podcasting, voice overs, interviews, field recording, conference calls, vocals and musical instruments. It is one of that mic which allows you select multiple patterns allowing it for a wider use. Voice is smooth and bright on this and makes Youtube audio a joy to listen to. The video embedded above features a demo of Blue Yeti recording various instruments.